Sydney Opera House, built between 1953 and 1973, is one of the iconic buildings of the twentieth century. Bordered on three sides by Sydney Harbour and adjacent to the Botanical Gardens, the Opera House is 65 metres high, 183 metres long and 102 metres wide. Its distinctive and cutting-edge design—and in particular its famous white parabolic 'shells'— earned it world heritage status in 2007. The Opera House in fact houses multiple venues, and home to Opera Australia, the Australian Ballet, the Sydney Theatre Company and the Sydney Symphony Orchestra. Its main concert hall seats 2,800, and features high vaulted ceilings and a 10,000 pipe organ. With over 1,500 performances hosted each year, attended by 1.2 million, and many more millions flocking to admire the architecture, the Opera House is Sydney's premier attraction. where? Macquarie Street, Sydney (a five minute walk from Circular Quay). £$€¥ Access to the Opera House is free. Tickets to performances vary in price. See the box office. Sydney Harbour Bridge is an iconic steel bridge which carries rail, vehicular and pedestrian traffic between the Sydney central business district and the North Shore. 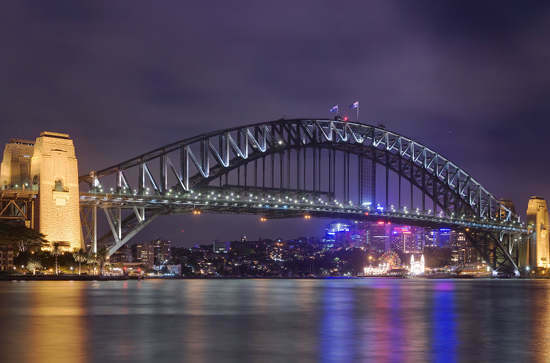 The Bridge (aka the Coathanger) weighs almost 53,000 tonnes, is 503 metres in length (making it the fifth longest arch bridge in the world), 134 metres high, and 49 metres wide. It was completed in 1932. At each end of the Bridge's arch stand a pair of 89 metre-high concrete towers, one of which contains a museum and tourist centre with panoramic viewing area. Many sightseers choose to take the Bridge's pedestrian walkway. Since 1988, the more adventurous have been able to climb the southern half of the Bridge with the BridgeClimb company (weather permitting). where? The Sydney Harbour Bridge Visitor Centre is found at 3 Cumberland Street, The Rocks, Sydney. £$€¥ The BridgeClimb experience costs from AU$122 for children and AU$188 for adults. Opened in 1916, and occupying 52 acres, Taronga Zoo is home to 2,600 animals from over 360 different species. It is one of the largest zoos in the world, organised into eight different areas, such as Reptile World, African Safari and the Big Cats Trail. Its inhabitants come from species that are native to Australia as well as more exotic locations. They include the Little Pied Cormorant, the Australian Pelican, the Red Kangaroo, Swamp and Agile Wallabies, Emu, Koala, Platypus, Giant Geckos, the Double-eyed Fig-Parrot, the Laughing Kookaburra, Pygmy Hippopotamus, Zebras, Giraffes, Chimpanzees, Gorillas, African Lions, Sumatran Tigers, Snow Leopards and Red Pandas. The Zoo was the first in Australia to breed baby elephants, with Asian elephants Luk Chai and Pathi Harn, born in July 2009 and March 2010, being two of its most popular inhabitants. The Zoo is built on a steep slope, with many visitors choosing to take the Sky Safari cable car to its top entrance and savour the harbour views on the way down. when? 9am to 5 pm, 365 days a year (4pm on 31 Dec). where? Bradley's Head Road, Mosman, Sydney. The Zoo is located 12 minutes from Circular Quay by ferry (ferries operated by Sydney Ferries and Matilda Cruises depart at least every half hour) or a short bus trip from the city (bus 247) or north Sydney (bus 257). £$€¥ Adults $44; Seniors/Students: $31.50; Children (4-15): $22.